August 30, 2015 with Orange County Symphony at Servite Theater in Anaheim. Thompson, age 15, is a 9th grade student of Crossroads school for Arts & Sciences, Santa Monica. He started his first violin lesson at the age of 4. Since the summer of 2012, he has been under the guidance of Samuel Fischer and joined the Colburn School. 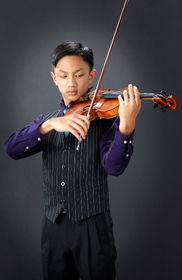 From 2012 to 2014, he won several awards in different competition: 2nd place in MTAC VOCE State Final and 1st in Satori String Competition; 1st place in SYMF Young violinist; 1st place in ASTA SoCal Final and he advanced to the 2014 state finals in Sacramento. This year, he won 1st place for Westside Concerto competition and JCM-OC Concerto Competition. As an award, he was chosen to perform with Santa Monica Symphony Orchestra and Orange County Symphony Orchestra. He received the Scholarship from YMF & Palisades Concerto Competition. Thompson currently a student of Junior Chamber Music and YMF Chamber Group. His trio group has been selected to perform at LACMA. Every summer, he participates in different kinds of music camp like Montecito Musical Festival and San Luis Obispo Strings workshop, and is the concertmaster in orchestra performances. He loves to participate in solo violin master classes. He studies with Almita Vamos, Emanuel Borok, and Linda Wang. He attended chamber music master classes by Lorenz Gamma, Susan Boettger, Joon-Sung Jun, and David Garrett. Aside from music, Thompson also loves to play basketball with friends. Thompson aspires to be a professional violinist. 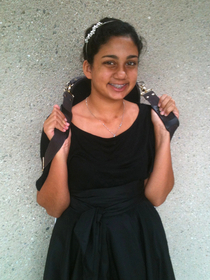 Amber Correa is 14 and attends 8th grade at Orange County School of the Arts, performing in their School of Music’s Junior High and HS Symphony Orchestra. Amber completed her 5th consecutive year of honors with JCM. Most recently, Amber was the Junior Strings Concerto Competition winner for the Brentwood Westwood Symphony Orchestra and performed in their Artist of Tomorrow concert in June 2014. Amber was also a debut soloist in the Young Artists in Concert with the Laguna Woods Symphony Orchestra in Nov 2014. Amber is a winner of complete works Bach Junior Festival. She has earned many awards and scholarships for her solo and chamber performances including First Place at Southwestern Youth Music Festival, VOCE and Orange County Korean Competitions. Amber was a Guest Performer for the NAACP Image Awards in 2014 and 2013 and the Peninsula LA Philharmonic Rising Stars Music Fair. Amber loves sharing her music with others and serves as a volunteer youth musician for NAACP and South Coast Interfaith Council as well as local community and church events. She was twice awarded the Certificate of US Congressional Commendation for her many volunteer efforts. Amber is continually grateful to all the musicians who support and inspire her most specially her teacher, Deborah Kim. Anna, 12, began playing cello at age five. She has played with the IUSD Elementary Honor Chamber Strings and is a member of the Pacific Symphony Santiago Strings. Anna attends the Orange County School of the Arts, where she plays with the high school OCSA Symphony Orchestra. Anna has participated in JCM for two years with honor groups. This year, she is looking forward to her first summer attending the Montecito International Music Festival. Anna currently studies with Professor Joon Sung Jun. Besides playing cello, she enjoys drawing, reading, and eating sushi.